Palm Beach Dramaworks’ continuing commitment to developing new plays in its Dramaworkshop initiative will add another element with a New Year/New Plays Festival in 2019 which will give public readings of five plays still in development. The project slated for Jan. 4 –6 will feature readings on the mainstage as well as a Saturday’s panel discussion, “Regional Theatre and the Future of American Plays,” featuring industry professionals from major organizations. The events give playwrights a chance to hear how a live audience reacts to the works still in progress and hear their feedback. The plays are The Captives by Barbara Blumenthal-Ehrlich, Drift by William Francis Hoffman, With by Carter W. Lewis whose work has debuted frequently in South Florida, Ordinary Americans by Joseph McDonough, and Red, White, Black and Blue by prolific local playwright Michael McKeever whose Daniel’s Husband just opened in New York City. With the exception of Ordinary Americans, the plays were chosen from among some 300 received by The Dramaworkshop, managed by Bruce Linser, during the 2018 submission period. Ordinary Americans was commissioned for a future mainstage production. “Simply put, new work is vital to the future of theatre. The economics of Broadway discourage Broadway producers from championing plays that have not previously been done elsewhere, which makes it imperative for regional theatres to identify, encourage, nurture, and bring to life exciting new plays. And I’ve found that audiences are hungry for the sense of discovery that this Festival will provide,” he wrote. Susan T. Danis, who has been transforming Florida Grand Opera for six years but who accepted a job as president and CEO at the La Jolla Music Society, has rescinded her acceptance and will stay as general director and CEO of FGO, the organization announced. The former employee “sent the letter under an assumed name. He has since retracted the letter, acknowledged that it was based on false information, was sent with malicious intent, and has apologized to FGO, LJMS, and Danis,” the news release stated. “With the recent changes in the Studio Artist Program and in the midst of important projects and transactions, I believe after six years of service, I owe it to the loyal board, patrons, and staff of FGO to see these through to completion,” her statement continued. The FGO board voted unanimously to reinstate Danis to her position. A source conversant with the situation said the letter made allegations regarding Danis’ conduct at a company prior to heading FGO. 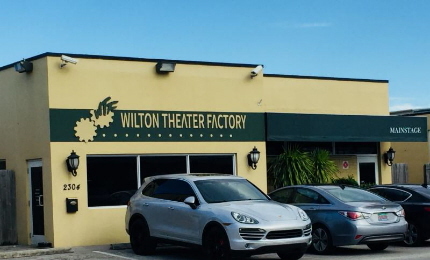 The dilapidated Wilton Manors storefront that edgy Infinite Abyss Productions turned into an intimate theater has blossomed to the point that the facility has been renamed the Wilton Theater Factory. The somewhat bare bones space received a huge boost in quality, equipment and scope three years ago when Island City Stage invested considerable money into renovations as it became the second full-fledged occupant. Together, the companies expanded their operation to a space next door which enables additional performances, rehearsals, storage and office space. The current set up just southeast of Five Points is the 68-seat main stage at 2304 Dixie Highway and the adjacent 50-seat Foundry at 2306 Dixie Highway. The spaces are also being rented to other companies such as Ronnie Larsen Productions. This entry was posted in News and tagged Florida Grand Opera, Infinite Abyss Productions, Island City Stage, Palm Beach Dramaworks, Susan Danis, Wilton Theater Factory. Bookmark the permalink.